Today, June 5, is the feast of the great Benedictine saint, Boniface (c. 675-754). Pope Benedict XVI wrote a general audience reflection on the life and work of the bishop and martyr. An abridged version follows. By comparing his ardent faith, this zeal for the Gospel, with our own often lukewarm and bureaucratized faith, we see what we must do and how to renew our faith, in order to give the precious pearl of the Gospel as a gift to our time. He was born into an Anglo-Saxon family in Wessex in about 675 and was baptized with the name of Winfrid. He entered the monastery at a very early age, attracted by the monastic ideal. 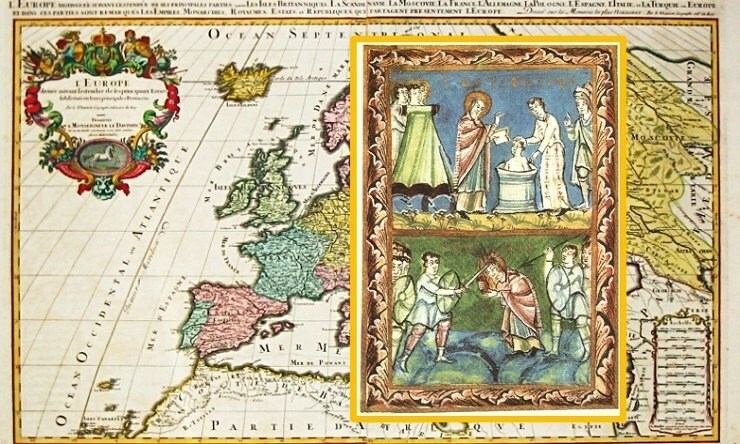 His country, Great Britain which had been evangelized barely 100 years earlier by Benedictines led by St. Augustine at the time showed such sound faith and ardent charity that it could send missionaries to Central Europe to proclaim the Gospel there. Since Boniface possessed considerable intellectual ability, he seemed destined for a peaceful and brilliant academic career. He became a teacher of Latin grammar, wrote several treatises and even composed various poems in Latin. He was ordained a priest at the age of about 30 and felt called to an apostolate among the pagans on the continent. [Later,] the Supreme Pontiff himself consecrated Boniface “Regional Bishop”, that is, for the whole of Germany. In addition to this work of evangelization and organization of the Church through the founding of dioceses and the celebration of Synods, this great Bishop did not omit to encourage the foundation of various male and female monasteries so that they would become like beacons, so as to radiate human and Christian culture and the faith in the territory. Above all the Monastery of Fulda founded in about 743 was the heart and center of outreach of religious spirituality and culture. It was to the credit of Boniface, of his monks and nuns for women too had a very important role in this work of evangelization that human culture, which is inseparable from faith and reveals its beauty, flourished. Although he was getting on in years (he was almost 80), he prepared himself for a new evangelizing mission: with about 50 monks he returned to Frisia where he had begun his work. While he was beginning the celebration of Mass at Dokkum (in what today is northern Holland) on 5 June 754, he was assaulted by a band of pagans. Advancing with a serene expression he “forbade his followers from fighting saying, “cease, my sons, from fighting, give up warfare, for the witness of Scripture recommends that we do not give an eye for an eye but rather good for evil. Here is the long awaited day, the time of our end has now come; courage in the Lord!’“ These were his last words before he fell under the blows of his aggressors. Centuries later, what message can we gather today from the teaching and marvelous activity of this great missionary and martyr? For those who approach Boniface, an initial fact stands out: the centrality of the word of God, lived and interpreted in the faith of the Church, a word that he lived, preached and witnessed to until he gave the supreme gift of himself in martyrdom. One result of this commitment was the steadfast spirit of cohesion around the Successor of Peter which Boniface transmitted to the Church in his mission territory, uniting England, Germany and France with Rome and thereby effectively contributing to planting those Christian roots of Europe which were to produce abundant fruit in the centuries to come. Boniface also deserves our attention for a third characteristic: he encouraged the encounter between the Christian-Roman culture and the Germanic culture. Indeed, he knew that humanizing and evangelizing culture was an integral part of his mission as Bishop. In passing on the ancient patrimony of Christian values, he grafted on to the Germanic populations a new, more human lifestyle, thanks to which the inalienable rights of the person were more widely respected. As a true son of St. Benedict, he was able to combine prayer and work (manual and intellectual), pen and plough.